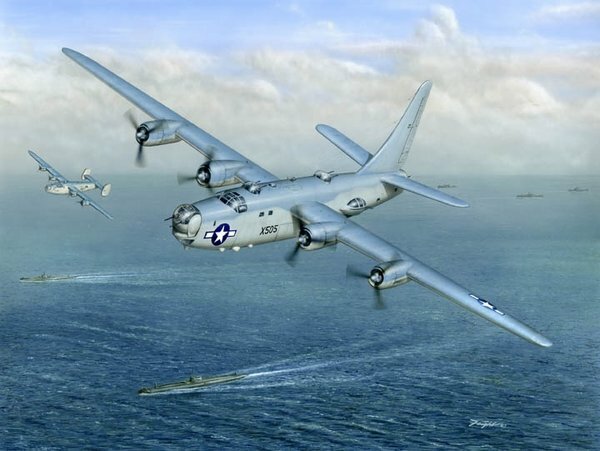 During World War II, the B-24 derived PB4Y-1 Liberator performed very well for the US Navy as a U-boat hunter in the Battle of the Atlantic and at the time was considered one of the best at the ASW task. However, in 1943 it was decided to fully navalize the aircraft as a long-range patrol bomber, so three B-24s were taken off the assembly line and reconfigured with lengthened fuselages, greater defensive armament, modified engine cowlings and a distinctive, single vertical tail. The resulting aircraft was designated the PB4Y-2 Privateer. With its 2,800-mile range, the Privateer was so useful that the Navy took delivery of 739 of them, though very few reached front-line service by VJ Day. The Privateer went on to perform great service in the Cold War as a radar and electronics-countermeasures platform. Following service with the US Coast Guard, the aircraft was retired in the early 1960s.